A lot of people who buy bits of physical gold aren't looking to make a bracelet or ring. They buy gold because they believe disaster is imminent. These investors are convinced gold will spike to $10,000 an ounce (it's currently around $1,225) when the U.S. government implodes, said Peter Hug, an executive at metals retailer Kitco. Hug calls these people "crazies" and says they form a substantial amount of the U.S. physical gold market -- at least 25%. It's no secret that gold has long been viewed as a form of insurance against disaster. The thinking is that even if the financial or political system collapses, gold will still hold value. The yellow metal is also widely seen as a hedge against inflation and the collapse of the dollar. Those are two things gold bugs have been deeply worried about given the massive amount of money printing the Federal Reserve has done since the Great Recession. The end-of-the-world trade: Hug's comments at the Inside ETF Conference last month may raise some eyebrows because he is an executive at one of the largest online retailers of precious metals in North America. These so-called crazy gold provide lots of business for Kitco. 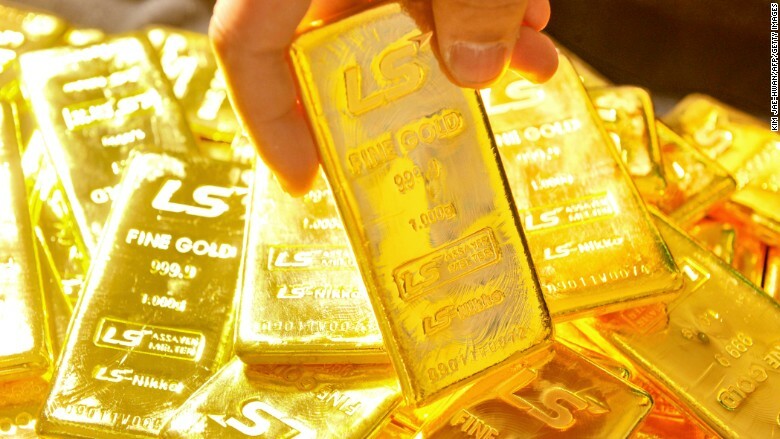 He said their influence is most obvious in the market for smaller units of physical gold between one and 32 ounces. "These investors buy the metal and it just disappears. It goes under their mattress. They want to use it when the world ends," Hug told CNNMoney. Irrational fears or smart safeguards? Peter Schiff, an outspoken gold investors for years, said this characterization of gold buyers is unfair. "The fears of an economic collapse in the United States are not irrational. I think it's more irrational when people are complacent that nothing can go wrong," Schiff told CNNMoney. It's tough to second guess those who bet on gold before the meltdown of Lehman Brothers in September 2008. Prices spiked from around $800 an ounce in late 2007 to more than $1,800 in 2011 as central bankers raced to stabilize the financial system and get out of the Great Recession. Where's the hyperinflation? Yet inflation remains nonexistent. Heck, deflation is more of a concern right now in many parts of the world. That's partially why gold has dipped to under $1,250 an ounce today. Schiff concedes that some people are so paranoid that they own nothing but physical gold. "That is being too fearful and maybe obsessed with it. But is that any less rational than the person who owns no gold whatsoever?" he asked. Schiff said his brokerage firm, which sells physical gold for delivery, recommends people have 5% to 15% of their investment portfolio in physical gold. Playing the fear card: Hug, a Canadian, said the fear trade is far more common in the U.S. than it is north of the border. This could partially be because Canada's financial system is viewed as less risky than Wall Street and experienced far less stress in 2008. "You can't play the fear card if you're a dealer or a speaker as well in Canada as you can in the United States," he said.